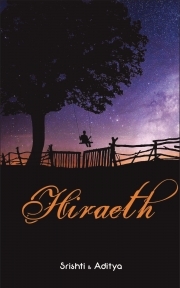 Hiraeth is a collection of melancholic verses that have been inspired by the beauty that exists in the universe. it is a journey, of exploration of love, driven by the belief that love pervades each and every atom that constitutes us. the poems here are conversations between the poets and their muses bound by the framework of words. this book is an attempt to capture the love which the universe showers on us and the love that we seek in this world presented through the eyes of two lovers. SRISHTI SRIVASTAVA- Srishti is a PR professional from Gandhinagar, Gujarat working in Mumbai. She is a potpourri of craziness who is spearheading love for cricket among the female citizens of India with a special room in the heart for M. S. Dhoni. A diehard fan of Amrita Pritam, Gulzar and Faiz Ahmad Faiz, she prefers to write on unconventional themes and performs her writings in open mics across Mumbai. Dogs are weakness for this self-confessed foodie. Photography is her passion. She dreams of the impossible, but makes it possible through her writing. ADITYA KURDEKAR- Aditya hails from the sleepy coastal city of Karwar, where fun is the way of life. Having spent the entire childhood under inspiring English teachers, it was natural that he would take a liking to creative writing. His interest in public speaking and writing were nourished well in his younger days at home and school. While he has finished his PhD from SSSIHL, research is still not done with him and he continues in his efforts to make the world a happier place to live. His heart is given to writing. He is researcher by the day, and poet by the night. In his free time he turns to Music, Poetry, blogging and reading.